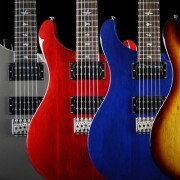 It’s hard to believe that PRS Guitars’ SE range has been around for 13 years. But it’s true – since 2001 the series has been offering incredible quality and great tone at affordable prices. Now the new SE Standard line-up is taking this philosophy to another level! Inspired by Paul Reed Smith’s early pre-factory guitars of the 1970s and early 80s, the SE Standards are built using all-mahogany construction and deliver fantastic tone thanks to their PRS-designed pickups. Despite their stripped-down price (the SE Standard series starts at just £399 / €499) the new guitars also sport a host of features shared with top-of-the-line PRS models including the iconic birds inlays, PRS stoptail or trem bridges and PRS’s legendary wide-thin or wide-fat neck carves. In 1985 a long, curly-haired Paul Reed Smith took a selection of PRS Custom and PRS Guitars (later known as the Custom 24 and Standard 24) to a tradeshow and PRS Guitars was born. Unbeknownst to everyone at the time, Paul was becoming “arguably the first ‘little guy’ to give guitar making giants…a run for their money. By upping the ante on quality, PRS compelled big American companies to improve their game, resulting in a full-blown American guitar renaissance,” (Guitar World). From two electric guitar models, to a full line up of electric guitars and basses, acoustic guitars, and amplifiers, PRS has kept that quality standard and has grown into a major industry presence. In celebration of the last three decades, PRS will be creating a series of blog stories recounting moments from the last 30 years as well as inviting and presenting testimonials from artists and players on their experiences with Paul and PRS guitars.